A brother in Christ once asked what could be done to ensure that his children would stay with the Orthodox Church once they leave home. As a mother of three grown children, I shared things that worked for our family to help our children to keep attending the Orthodox Church once they left home. Our three children range in age between 30 and 20, all having attended university and college away from home and away from their home church. They all attend church regularly on their own and are involved with their churches, all Orthodox, in various roles and vocations. Mind you, they have not finished their journeys yet, but so far so good. These are the things our family did that I could think of which seemed to help our children to stay with the Church after they left home. Maybe some of the ideas will not work for your family, but this is what worked for our children. You have to take the personalities of your children into account. What I describe has been the experience of our family in a very generalised form. The Lord has blessed what was done for the children’s benefit in spite of the mistakes that we made and the many places where we failed to do what should have been done. I hope that the sharing of our experience helps someone even in some ways. It is such a blessing to see one’s children still in the Church when they leave home. May our Lord God Jesus Christ bless and keep the children in the One Holy Orthodox Church as they continue their journeys with Him! 1. Church and More Church: We took the children to church, Church school, and Church youth groups as much as we were able to from as early an age as possible. We were involved in our church, Church school, and youth group with them. If it is so important that parents put their efforts there; that says something to the children. 2. Home Lessons: If and when an Orthodox service was not available, we took the time and effort to teach the children ourselves at home. It is possible to obtain Sunday School materials and teach the children yourself under those circumstances. One doesn’t have to be a teacher by profession to use the Church School materials. It is laid out very clearly for anyone to use. When we spent one school year on one of the Gulf Islands, the nearest Orthodox church was hours away. I held church school for all three children at home on Sundays. The youngest was four then. When we came to the city for a weekend, we then brought them to church with us. 3. Teachable Moments and Communication: There are good children’s versions of Bible stories to familiarise them with the events and people of the Holy Scriptures. These made great bedtime story books. We read to them these and other appropriate children’s stories a lot. The children learned to love books and reading so that the Holy Scriptures were easier to read later on. I watched for teachable moments when we could talk to them about God and His creation or about Jesus Christ and His love for us and all people. Going for walks with the children set the stage for this well. At varying ages, the children had different bedtimes when we could go and tuck them in for the night. This gave a wonderful opportunity to sit and talk with each one alone for a few minutes about their day. It was usually at the bedtime that their concerns or fears revealed themselves, and we could talk about these things then. This didn’t happen everyday, but there were times. Then it was a time to share with them God’s love and care for them, and their uniqueness in God’s creation. It also helped to develop a pattern of open communication with the children. Eating meals together and also doing chores like dishes with the children also provided communication building opportunities. Once established, then the lines of communication can be maintained throughout their lives. 4. Sunday morning – no sports: When we enrolled our children in a sports program such as little league baseball, which often holds its tournaments on Sunday morning, we specified that we would only enrol our child if he would be allowed to miss games on Sunday morning when we have church services. The organisers were agreeable, and it was understood that our children would not play some Sunday morning tournament games. I remember us rushing home after church so that our son could then join his team and play the rest of the day’s games. It was sufficient for him, and he never complained. But this taught him that church is more important than games to play. His team always welcomed him back happily, and there was no problem with missing games. 5. Disciplined Attendance: If, for some reason, the family missed attending church, the children sometimes expressed resistance to attending the next time. They had tasted the freedom of a Sunday out of church, or some distraction was more fun. We discussed, gently but firmly, that they were a part of our family and stated that the whole family was attending church. We have experienced this with children aged 10 to 14 especially. Once they attended again, they always expressed gratitude for having gone back again. It was sooo easy to ‘get out of the habit’, to become distracted by worldly things. It was good to talk to the children about this, that they noticed ‘how good the Lord is when tasted’ again. It was something that was good to discuss after the refreshing return to worship. Something to point out to older ones is that even adults struggle with this in their spiritual practices – whether attending church, building a prayer life, or building a devotional time with the Holy Scriptures. Miss a few times, and it becomes less important to go back, but when one does, oh, it is so wonderful to be back. It takes self-discipline, perseverance, patience with oneself, ability to prioritise (i.e. to learn to love Christ above all else), and to be consistent. One tries to do these things. 6. Train them up in the way they should go: We loved the children, disciplined them (tried not to spoil them), taught them to work hard and not to expect all their wants. We taught the children to love, to be self-controlled as much as possible, and to share. These things, learned at a young age, helped them with parallel spiritual lessons later. We taught them to play, to be creative, to appreciate different kinds of music, to know how to fill their own time without ready-made entertainment such as TV. We helped them to learn to be discriminating in their choices of ready-made entertainment. (Complaints about being bored were solved by offering them some work to do instead. It was amazing how soon the children learned to find something to fill their own time in a way satisfying to them when they were offered chores to fill their time! We checked to see what they had found to do and encouraged the solutions that they found. No more boredom! This was their first lesson in ‘redeeming the time’.) We played with the children, and they worked with us as part of the family. 7. Raise your own: When the children were in their most formative and impressionable years, 0 to 4, we didn’t give them over to someone else to raise (and to teach values, attitudes, etc.) That included baby sitters, day care, and play school. I know this sounds drastic today. There were times that we did use baby sitters for a few hours. But my husband was quite definite that we should take the children with us most places that we went, as much as I dreaded it some times! Getting a baby sitter would have been so much easier at times. But now I’m glad that we made the effort to keep the children with us as much as possible. I didn’t work outside the home until our youngest one was in grade 4. The ideal would have been to stay home full time until all had finished high school, but life isn’t always ideal. Today’s economics practically demand that both husband and wife bring home an income, and, of course, single parents have no choice but to work. You do what you can. Since we were both teachers, we thankfully didn’t need to worry about latch key situations since one of us was always available right after school to be home with the children. It was very important for the children to learn our values, beliefs, and attitudes from that young age. It is amazing how quickly children learn the things you don’t want them to learn when you give them over to day care or preschool situations. Mind you, there was a trade off. Our children did not have the more advanced social skills when they started school because of their relative isolation from other children. However, there really was little problem with catching up socially once school started. The problem of the social aspect is less pronounced in larger families where there are several siblings with which to interact. Looking back the first child could have benefited from a “Moms’ and Tots’” group where a parent could monitor and observe what is happening around the child but still provide social experience with other children. However, having learned from an early age to be independent of the social group helped them to develop independence in their decision making. Their decisions were not as controlled by peer pressure. Two of the three children were very resistant to peer pressure through high school and into their college years. It wasn’t so important to them to be like the rest or to be part of the group if the group wasn’t doing what was acceptable. They weren’t socially dependent. 8. Quiet times: Another important aspect was teaching the children to learn to cope with time alone. While our children needed other children to play with from time to time, it was also important for them to learn to play alone. It taught them familiarity with silence, and this is a prerequisite to hearing God. Also they aren’t motivated by desperate loneliness. Those children who are constantly stimulated by sound and many people around them do not learn to appreciate quiet times alone as easily. 9. Sharing love in the Church: We taught the children to love and respect the older generation, other children, and other families in the church. Again by our own example and by discussion, we encouraged the children to pay attention to the elderly and lonely in the church to show them love. This taught the children the human context of love in the Church (in spite of human failings). All it took was going up to someone and saying hello, talking to the person a bit, and giving a hug or hand touch. The love the children received in return impressed them with the reality of the family of God in the Church, of which they became a recognised and beloved part. 10. Getting to know the priest: We invited the priest and his family to our home and the children saw how we interacted with the priest. We let the children spend some time talking with the priest in our home. We arranged for times when the priest was available to teach the children in some context, whether Church school or youth groups, or a youth/children’s day with the priest. We encouraged and arranged for older children to discuss spiritual matters with the priest on a private personal basis. They learned that the priest is someone who is approachable and willing to help them with their questions or problems. 11. Through Protestant Friends: Fortunately, we escaped the scenario where our children might have been tempted by Evangelical Protestant friends to go to their ‘more fun’ church times or Sunday School. Our children had Protestant evangelical friends who did invite them to come to their churches. Our youngest even attended an Evangelical Protestant separate school for several years. This gave us opportunity to discuss the differences in approach to worship and belief between Orthodox and Protestant evangelism. Parents of children with evangelical Protestant friends who make strong and appealing invitations to attend church with them instead of with the family definitely need to enlist the aid of their priest and church school teachers to make them aware of the situation. They also need to have the parish priest and lay educators actively involved in the teaching of the children about the differences “between our church and theirs” in a non-condemnatory way. (Our priest made the completeness of the Orthodox faith a topic of instruction for the older youth group.) After all, these are their valued friends who should not be harshly criticised for their beliefs. One good explanation that I was given is that the Protestant churches are not all wrong in what they believe, but their belief and worship is incomplete. The Orthodox Church has the completeness of belief and worship that we need to obey and worship God. If the decision to allow a visit to the Protestant church is made, with the priest’s guidance, the parents should go with their children when they are invited. This gives a common base for discussion about what they see and hear there. Discuss the importance of the aspects of worship that were absent from the Protestant church and the errors in understanding about communion, if it is even served. We taught our children that there is an important difference and taught what is lacking in the Protestant setting, and that we do not lack in the Orthodox setting. Again, the priest and the Church school teacher should also be involved in this process of explaining to the children. Also, the visit should be reciprocal as well so that the Protestant friends should come to our church in the exchange with someone to answer their questions about what they saw and heard. Orthodox children need to realise that their baptism into the Orthodox Church makes them part of the Orthodox Church family. One worships with one’s family, not with a strange family. For younger children this is much like visiting family members with love; they visit their own cousins and grandparents, not their non-family friends’ cousins and grandparents for family celebrations. The Divine Liturgy is the celebration within the family of God, which they joined at baptism. There is a time to have fun with friends, a time to be with family at home, and a time to be with the family of God they belong to in the Orthodox Church. Above all, the family priest should be involved in helping the children to overcome the temptation of going to church with the Protestant friends instead of the family’s Orthodox church. Firmness without proper teaching will not keep our children from wandering off from the Orthodox church. Don’t let the children be fooled by the over-emphasis on fun and emotion in Protestant youth worship group settings. Emphasis in Orthodox worship is the joy in the Holy Spirit which lasts. Fun is temporary and depends on the situation and entertainment only. There is a time for fun and play in children’s lives, but there is also a time to learn to worship, to respond to God with an attitude of giving of oneself rather than with the attitude of waiting to be entertained or only to take something away. Our children learned to experience peace and joy through learning how to reach out to our Lord in the ways provided within our Orthodox worship. They were guided in learning to participate in worship to become joyful worshippers, and that in the giving of themselves they received peace, joy, and more love for others as well as a sense of being loved by God. This happened in varying degrees at various times but they were able to experience worship and a living relationship with God. After this, they said that attending Protestant churches was a very unsatisfying experience not to their preference at all. They could sense the lack in the Protestant worship since they had been taught what to look for. 12. Consistory sponsored special presentations for youth: We also took our teens to presentations provided by our Church Office of Missions and Education and St. Andrew’s College about characteristics of cults and other topics. These are authoritative presentations for our youth, are well presented, and impress our youth while providing much needed information. It is well worth the time, money, and effort for youth to attend these. 13. Navigating the problem waters: When things became less than perfect on the church scene, we tried to speak lovingly and graciously about the people involved, to be an example of Christ’s love and forgiveness to the children. We didn’t leave the Church, cut back on attendance, withhold our financial support, show disrespect for the priest or other Church members, or refrain from helping in situations that were challenging to Christian love. Each of these actions would have taught the children a negative message about the Church itself. The children were watching us navigate the church waters and learned our attitudes and values in those situations, hopefully merciful ones. The children learned that the Church is something one doesn’t leave for any reason. 14. Active Church life for Children: We arranged for children and youth to have an active role in church worship and activities. They need to feel a part of the Church community. For example, when our ladies’ group felt overworked, the youth took over preparing, serving and cleaning up the fellowship lunches after Divine Liturgy. The women were relieved and the youth (with supervision from two mothers) did an important job very well. We welcomed children and youth to the choir, and youth had rotating Sunday duties in the services. Youth and children helped with church cleaning, gardening, did visitations to the shut-ins, went carolling at Christmas at Seniors’ Homes, member and adherent homes. We helped the children live an active, productive, sharing and caring Church life along with the adults. We let older children become mentors for children in the younger children’s group to interact with them. We encouraged our children to participate in the Eucharist by example and instruction. 16. Building a Support Network away from Home: When the opportunity arose, for the middle and high school age children, we arranged for them to meet with other Orthodox youth from sister churches to interact with them. We took them to summer church camp, to the church affiliated Institutes for summer Ukrainian language courses, conferences, youth jamborees and other gatherings. This showed the children that their church experience wasn’t just a local phenomenon and that others shared this experience with them. It reinforced the validity of the experience for them as well as providing new opportunities for them to share the Orthodox Christian experience with new friends. It provided opportunities for our youth to meet other priests, lay people, and youth from other locales so that they would have a ready network of people they knew to fall back on when they would leave home. Making visits to other sister Orthodox churches when we made family trips away from home helped to provide this, too. Going to church on Sunday or on feast days was on the holiday agenda. This modelled the behaviour for the children of attending a church other than your home church. 17. Prayer corners and all: When they were home and old enough, we provided them with an icon corner in their bedrooms, their own Orthodox Study Bibles, prayer books and other Orthodox reading material to encourage private devotional and prayer times. When they left home the icon corners, Bibles, prayer books and other books went with them. 18. College area contacts: When the children left home to college they had someone in their new area to contact them about attending Church, to give them a ride, to be a friendly welcoming face in another strange congregation. (They each chose a different city in which to study!) We contacted adults – some family, some friends – that the children already knew in the college area and asked them to contact our children to support their first experiences to a new congregation. 19. 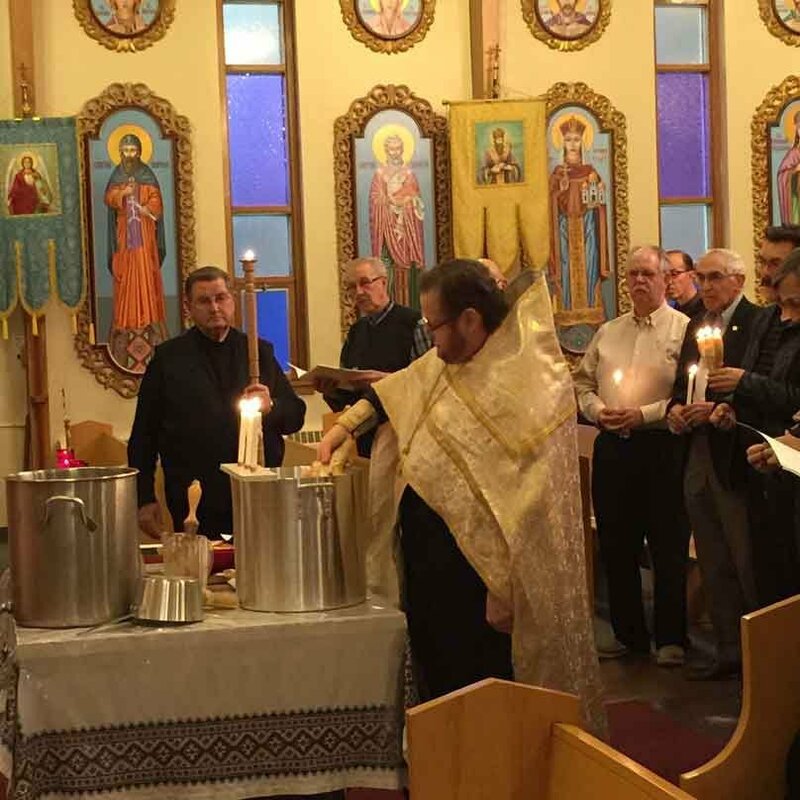 Living at the Home away from Home – a Ukrainian Orthodox Institute:Since they all stayed at one or other of the church affiliated Institute residences for Ukrainian Orthodox students, the contact adult sometimes was the rector at the Institute. Some of the institutes have daily morning and/or evening chapel services. Some arrange rides to the city churches on Sunday morning. Whatever form it takes, there is an Orthodox Church presence at the Institutes. It all helps. Being the independent, newly-free-from-home young adults, they usually found their own ways to church after the first few times. 22. Pray, pray, pray for the children: I had to learn that the children were given to us by God and that our care of the children was for Him; we raise them for Him and His glory. I yielded the children to God’s care also in prayer. Like Hannah who gave Samuel back to God, I had to learn to yield the children to God’s ownership, care, and service. 23. Journeying to God with your children: Mind you, we never started with this ‘program’ planned out ahead of time. Some parts of it were done intentionally, and others just happened. It was a learning experience for us – a most challenging one at that! It is much easier to look back now and see what we did do and what effect it had on the children. In general Christian home life, Church life, and prayer were the three keys that I believe helped our children to stay in the Church. When I say Christian home life, it was rather minimal compared to what could have been done. We were beginning our own spiritual journeys learning about our own lives with Christ while we were raising the children. We did not regularly pray before meals or pray together as a family or read the Holy Scriptures together as we could have. These were done in a very haphazard manner usually singly and more privately. The children watched the constant reaching forward toward God as we were learning to strengthen our own relationships with Christ. There is a mysterious way that children have communion with Christ and learn from Him. In general, I think we don’t give children enough credit for their capacity for spirituality. In many ways they are more sensitive to the Holy Spirit than most adults, before the children have yet had the chance to learn how to be insensitive to holy prompting. It was important to provide the right setting for the children to respond to the love of Christ when they were able to do so more easily as little ones. Children have a great hunger for a spiritual life. Guidance and teaching helped them to maintain the progress as they grew in a setting that helped them to continue their journeys with God in the Church, by the Lord’s grace, love, and mercy. They learned to love Jesus Christ and His Church, and the people in it along with the cultural context in which the faith was expressed. One doesn’t leave what one truly loves. Why Do People Come to Church? What does “Ukrainian” have to do with “Orthodox”?